We had another terrible week here. Illness, a trip to the doctor, late nights, difficult mornings. We finally got to Friday, and I thought, “If I can just make it through this one day, everything will sort itself out.” And then, we opened the garage door. My first thought was that someone had broken into the garage and ransacked it. It was like in the movies, when you come back to your Manhattan apartment, and it’s been completely torn apart by mafia henchmen looking for the secret code-breaking software. Except it was the garage. And then I realized that the car was fine, it was just everything else that was strewn all over. Then I realized that we had probably accidentally closed some creature in the garage overnight, and the poor thing had been scrambling trying to get out. 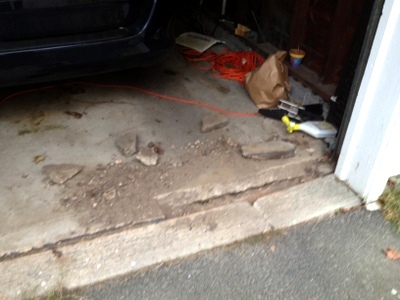 It had even pulled up some of the concrete underneath the door trying to dig its way out. Well, by that time the garage door had been open for a good half hour, and I figured the little critter had made its exit. I started to pick up just enough stuff so that I wouldn’t run anything over backing out. And then I heard it. A little scratching scrambling sound coming from behind the garbage cans. It was like in a horror movie when you realize, “IT’S COMING FROM INSIDE THE HOUSE!“ I squealed like a little girl and jumped into the car. After my heart stopped pounding, I got out and crept up as close as I dared, held my phone out at arm’s length, snapped a shot, and leaped back into the car. 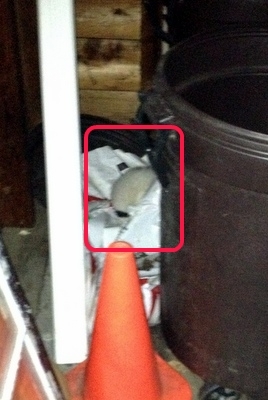 That furry white lump is a skunk! We were wicked late by this point, so we just left, leaving the garage door open so that it could leave. And then we got home and it was still there. You see, skunks are nocturnal. It had slept the day away while I was at work. And it was still there. So we put our Skunk Removal Plan into action. I banged on the back of the garage hoping to get it to go out the door. 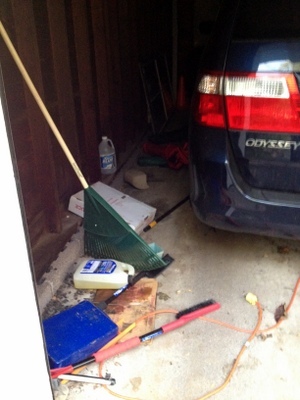 It just skittered along the back wall of the garage but wouldn’t come out. I opened the back door, and it just sat there and stared at me. We enlisted the help of our lovely neighbor who donated dinner scraps to lure the poor thing out. 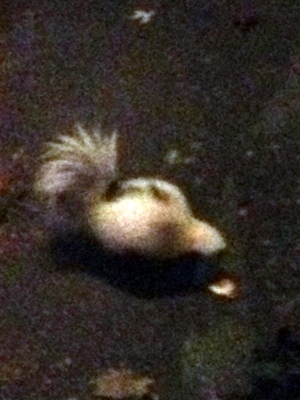 We all went inside to finally get dinner going, and lo and behold, the skunk crept out and started eating. Me: Can you see it? Me: Is it still eating? Jake: Yes, it’s still eating. I’m walking in the back door of the garage. Jake: The skunk is on the move! The skunk is on the move! 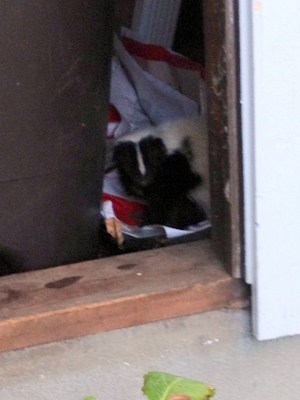 Me: <loud squeal as it’s walking toward me into the garage> GO AWAY, SKUNK! And he turned around and high-tailed it out (no pun intended!). I was able to close both doors, and we all ran inside. He eventually came back and cleaned the dinner plate, and then wandered off to find another garage to hibernate in. And that the was icing on top of our week. Every year we go to Mike’s Maze. It’s really fun, not just because it’s a corn maze (what’s not to love about that?! ), but because they always tie in some kind of game that ensures that you will traipse over every inch of the maze looking for clues and earning points. What are the points for? Nothing, really. It’s just for fun. This was the first year we did the whole game – there was no crying or whining, and no one needed to be carried. We’ve come a long way in the last year! 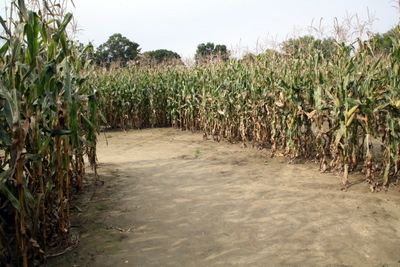 This year’s maze is a tribute to agriculture, and there were about 20 questions at various places throughout the maze. We recorded our answers and either gained or lost pretend money based on our guesses. In the end, we ended up almost breaking even, which was pretty good! There was also a coloring game for the little kids, which Lydia and Aaron were able to do. 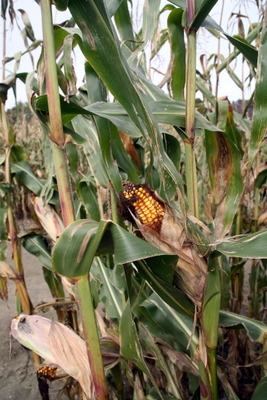 It was the perfect day to spend wandering around in corn – not too cold, not too hot. 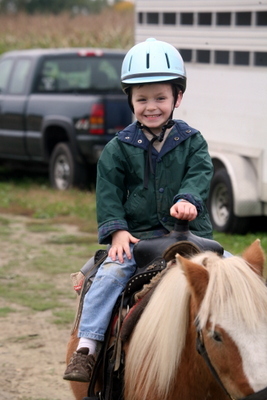 And Aaron decided he wanted to go on a pony ride, and was very excited about it! We always get our Halloween pumpkins at Mike’s. They are currently sitting on the screen porch (safe from the squirrels!) waiting for Grandpa to get here to help carve them. Halloween is just around the corner! Fall is my favorite season. Where I grew up, October meant warm days, little fog, and air so crisp and clear you could see out past the Golden Gate to the Farallon Islands. 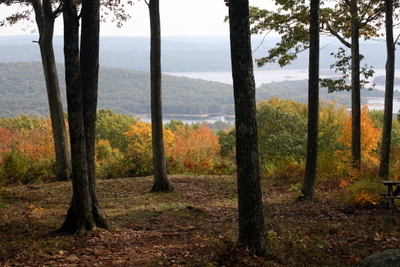 Now that we live in the Northeast, October means crisp air, changing leaves, and cold nights. Either way, it’s my favorite season. I’m lucky that my birthday falls in early October, usually falling close to the Columbus Day Holiday. 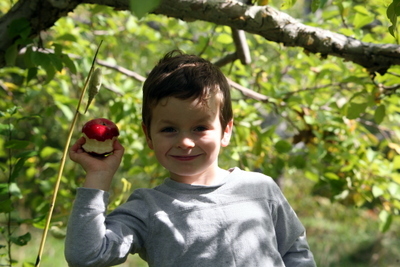 We celebrated this weekend by going apple picking, one of our favorite fall activities. We had been worried about the apple crop this year since we never really had a winter last year. There were dire warnings about the apple trees not flowering because the trees never got a freeze, etc., etc., etc. All of that worry was for naught. The apple crop has been bountiful, at least at the orchard we usually frequent. 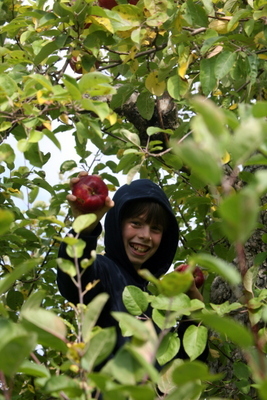 Jacob climbed one tree, and pretty much filled a half bushel bag just by passing apples down. 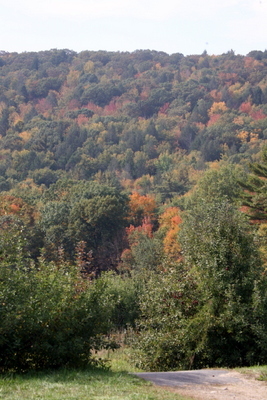 We’re not quite a peak foliage, but it was lovely, nonetheless. 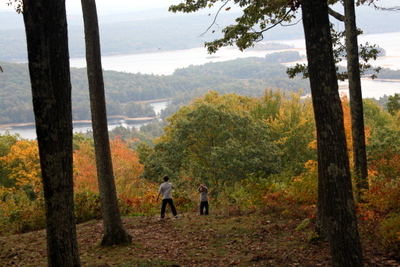 After we had picked, we took our fresh-pressed apple cider and our still-warm cider donuts and went to our favorite Quabbin spot – usually peaceful and deserted. This day was no exception. We are all recovering from various illnesses, and had had a rough week – this outing was just what we needed to recharge the family batteries. I’ll post later this week about our other weekend adventure. Here’s to fall everywhere!